The Sandlot TV series has landed a home at Disney+. Original director and co-writer David Mickey Evans previously teased the show last month, noting several of the cast members from the movie will be reprising their roles and it takes place in 1984, 22 years after the movie. The show will reportedly focus on their children, though no further information is available. At the time of the initial reveal, Evans could not say which streaming service he was going to be working with, noting, "It doesn't take a genius to figure that out right now." Many assumed he was referring to Netflix or Hulu. 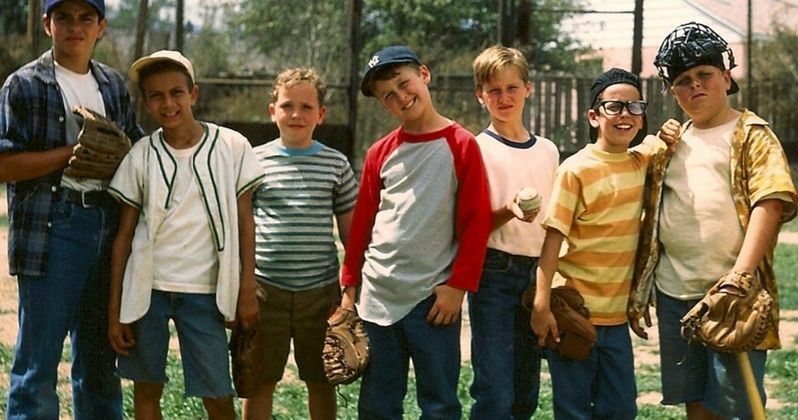 Cult classic The Sandlot debuted in 1993 and starred Tom Guiry, Mike Vitar, Karen Allen, Denis Leary, James Earl Jones, Patrick Renna, Chauncey Leopardi, Marty York, Brandon Quintin Adams, Grant Gelt, Shane Obedzinski, and Victor DiMattia. While the movie didn't set the box office on fire, it has become a cult favorite over the years and dialogue from the movie is constantly quoted as if it were released in theaters last week. Most of the members of the cast still get together frequently and fans love seeing them reunite like they did for last year's 25th anniversary. When David Mickey Evans originally revealed The Sandlot TV series was officially happening, he mentioned it was for a 2-season deal. Also, it's not clear which members of the original cast he was referring to will be returning for the Disney+ TV series. With that being said, the show could be following the lead of the massively successful Cobra Kai series on YouTube, which would not be a bad thing at all. The Karate Kid series has juggled nostalgia while blazing a new trail very well and The Sandlot series could benefit from the same treatment. David Mickey Evans is also developing a prequel to The Sandlot at the moment. Evans is working on the project with Austin Reynolds and is expected to take place in the 1950s. It's going to be very interesting to see how Disney+ handles bringing the cast of The Sandlot back together and where Evans has taken the story. It isn't clear how long one season will be for the Disney+ series, but if it follows the trends of the Marvel and Lucasfilm projects, it could have a pretty sizable budget. Disney+ is working on a lot of projects at the moment. Earlier today it was revealed they are working on a Love, Simon sequel series and earlier this week it was announced they are developing an Avengers TV series focused on Hawkeye too. There are now multiple Marvel Studios projects in development, including two new unscripted shows. There's also the live-action Star Wars series, The Mandalorian, which is expected to be featured at the Star Wars Celebration this weekend in Chicago. Variety was the first to announce The Sandlot Disney+ series news.